More isn’t always better. Many new and experienced gardeners feel overwhelmed by the thousands of seed varieties they can choose from. To make matters worse, finding organic heirloom seeds (that have been grown sustainably and pack the most nutrition) can be a daunting task. GrowJourney takes a different approach than other seed companies. We select interesting varieties of certified organic heirloom/open-pollinated seeds from our network of certified organic farms around the country. Each month throughout the year, five new seed packets will arrive on our subscribers’ doorsteps, each selected to grow in their Agricultural Zone. It’s like getting a new present every month with a fun surprise inside. Somewhere between 75-95% of all the seed varieties that were cultivated by our ancestors over thousands of years have been lost in the past century, as industrial farming has selected only a handful of standardized and hybridized varieties. This tremendous loss in seed biodiversity can not continue. GrowJourney is trying to reignite a passion for heirloom seeds (our shared genetic library) while encouraging people to write new “books” by cultivating new varieties of open-pollinated seeds that will become tomorrow’s heirlooms. We want to help grow a healthy food revolution, and our heirloom organic seeds are our ammunition! Viva la Revolucion! Fresh, sun-ripened organic produce is essential for human health and wellness. Yet for most people, this type of produce is difficult to find or afford. Growing food using conventional gardening methods takes a lot of time and work, not to mention it harms the environment (including people) through intensive tilling and the use of synthetic pesticides and fertilizers. We’ve been growing our own healthy food for years using organic/permaculture practices that help restore human and environmental health, and we share this knowledge with our subscribers through an array of online and offline resources. The growing methods we use require no synthetic pesticide or fertilizer application, no soil tilling and they help people become educated about how nature works and how to mimic nature in their own gardens. This approach builds healthy soil, healthy ecosystems and healthy people. This means people can have access to a broad variety of ripe, delicious organic foods that they grow themselves for a small fraction of what it would cost to buy from a grocery store. 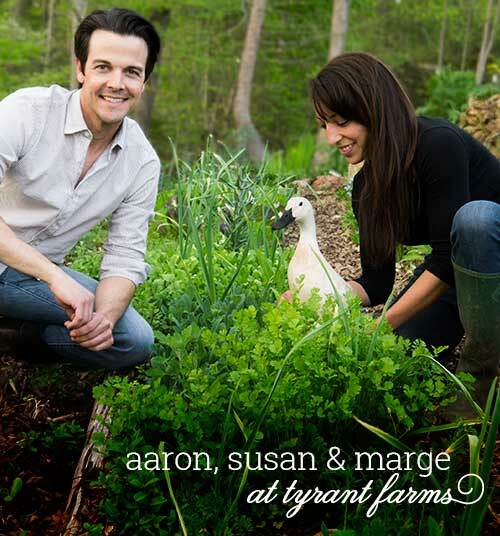 Aaron and Susan in their garden, aka “Tyrant Farms” (named in honor of the bossy Susan) with one of their Welsh Harlequin heritage breed ducks, Lady Margaret Thrasher. We’re Aaron and Susan von Frank, the husband and wife co-founders of GrowJourney (by Tyrant Farms). We want to share our life’s passion with the world, one seed and one person at a time.